Ave Maria, Florida – the town with a Catholic heart.©™ Stories & information for residents & visitors. If you drive through Coquina and spot a house with a single-car garage and ten bicycles in the driveway, you know you have found the McQuades. If you venture inside on a typical day, you will find seven McQuade children scattered throughout the home playing, reading, or working on their homeschool lessons. Among them, two young men from Immokalee homeschool as well. Another son, Hadyn McQuade, passes through between classes at Ave Maria University to give a violin lesson. Two more adult children pop in on occasion when they take a hiatus from their work or study to come visit. If you’re really lucky, there may be a litter of Goldendoodle puppies to play with! The McQuades breed their family dogs and car e for the puppies until they are ready to be sent to loving homes. The lifestyle of this family of 12 may seem a bit over whelming to some, but the McQuades wouldn’t have it any other way. Their adventurous and fun-loving journey began at Ole Miss where Mike and Jenn McQuade met. The two fell in love and got married. The McQuades have moved 19 times as a family. In the early years of their marriage, Mr. McQuade was in the United States Air Force. He flew F-16s all over the world. In fact, they were living in Korea when their first child came into the world… 16 weeks early! It was the Fourth of July weekend and the McQuades were spending time with some military families at the beach in Korea when Mrs. McQuade suddenly became ill. She developed a very high fever and had to be rushed to the hospital while her husband and friends packed her body with ice. The hospital was five hours away. able to breathe until they could be transferred to a hospital with a neonatal ICU. Mrs. McQuade was unconscious for three days. Thankfully, the two survived without any lasting complications. Now, Rylan, 24, has just begun his second year of medical school, is newly engaged to be married, and aspires to use his gifts and training on medical missions. Three brothers followed Rylan into the world: Curran, 22; Hadyn,19; and Eamon, 17. While the young family was just about to set down roots in Texas — as the builder broke ground on their new home — two air planes struck the twin tower s on September 11, 2001, and their plans instantly changed. Mr. McQuade had started working for American Airlines and was part of the U.S. Air Force Reserves at the time and was immediately called to fly around New York and Washington D.C., protecting the area from any potential threats. The Air Force had planes in the air 24 hours a day for over a year. The family found a home in New Jersey that was move-in ready, so they packed their things and moved sight unseen. “People were so gracious and understanding during the time after 9/11. We got our money back,” Mrs. McQuade said of their home in Texas. A little over a year later, they moved back to Texas and Mr. McQuade continued flying for American Airlines. But in 2003, the airline forced Mr. McQuade to work out of the Saint Louis airport. “Rather than commute back and forth between Texas and Saint Louis, we decided to put our camper on the Air Force base in Saint Louis so we were able to have the whole family there and together 218 square feet was more than enough for the happy 6 of us!” Mr. McQuade said. They lived in the camper for eight months. Living in such close quarters with four kids did not lessen their desire to expand their family. The McQuades had always hoped for a large family, but as time wore on and Mrs. McQuade wasn’t getting pregnant, they felt that maybe God had another plan for them. They began to contemplate adoption. After yet another move – this time a transatlantic one to Germany – the McQuades really felt that God wanted them to adopt, but were unclear how to proceed. One night, Jenn prayed for a sign. If adoption was what God wanted for them, she prayed He would make it clear. The next day, the family went to a different church than their usual one. A woman there, whom they hadn’t met before, approached Mrs. McQuade. The woman had three children with her. She sat down and said, “I just want you to know that my children are adopted. I don’t know why I’m telling you this. I never tell anyone that my kids are adopted because they look so much like me, but I just feel like God wanted me to tell you that.” That was the sign the McQuades needed. Their next adventure would bring them to China and back home with a baby girl named Grace, now 10 years old. At 16 months old, Gr ace had many physical and emotional obstacles to overcome, but her new family, including her four big brothers, put all their effort into helping her get well. Challenging as it was, it was more than worth it and they decided to adopt another baby girl from China? Hope, now eight years old. They felt so blessed to have these beautiful girls in their family, but they weren’t finished yet. They began making preparations to head back to China, this time to adopt a baby boy. That boy was Liam, now six years old. During the long wait for Liam, they learned of another boy in an orphanage there who was about to turn 14 – Keane, now 19. When a child tur ns 14 in an orphanage in China, they are sent out onto the streets. “I would read the stories of these older children who so desperately wanted a family. It broke my heart to read their stories and I advocated for them on the Yahoo groups and our blog. We prayed for these children and rejoiced when they found their forever families. We cried as we watched so many lose that chance. God was changing our hearts as a family.” Mrs. McQuade wrote. They had only a few short weeks to raise the additional $17,000 for their second son’s adoption. Thankfully, they found a great organization that could help them raise money. It was called “Both Hands.” The organization, named for James 1:27, was designed to help widows and orphans. The McQuades found an elderly widow who needed help with her home. They raised funds and worked to do a complete remodel of her home with donated supplies and volunteered labor. Then, their completed project and their desire to adopt two boys from China was published on the organization’s website, on their blog (gettingliam.blogspot.com), and sent out in “support letters.” People began to donate money. They raised $14,000. “As you’d expect from the God we serve, the last $3,000 came in the very day we left for China,” Mr. McQuade said. It was clear that Keane was meant for them. They got both boys the day before Keane’s 14th birthday. It was a bit daunting bringing home a teenager who spoke no English, especially since the McQuades spoke no Mandarin, but Keane learned quickly. He fit into the family perfectly. He was diligent with his schoolwork, loved to read, and was happy to help with household chores. The family recalls how fun it was to watch him try new things for the first time, like swimming, skating, guitar and jumping on the trampoline. Liam acclimated to his new home quickly, too. He was full of energy and enjoyed playing with his sisters. Their family was feeling more complete with each adoption. He was referring to the boy with whom he shared a room at the orphanage — Kai, now 16. The McQuades were touched by their son’s love and compassion for his friend. Keane added, “I remember money was a problem for getting me. If you need more money, I could give you all of mine.” Of course, the McQuades could not refuse. They brought home Brogan and Kai together, making them a family of twelve and making two boys, who were best friends, brothers! The McQuades are so thankful for the beautiful journey their family has experienced through the adoption process. It’s been a life-changing experience for everyone. Looking back on their journey, they can see the hand of God at work, even in the details. After many years in the Evangelical faith, they recently came back to the Catholic faith in which Mr. and Mrs. McQuade were both raised. During their reversion to Catholicism, they started to consider making the move to Ave Maria and they’re glad they did. “We finally feel like we’re at home,” Mr s. McQuade said. “We feel at home primarily because of our coming back to the Catholic Church, but also because this is such a special community to be a part of,” Mr. McQuade added. The McQuades have not been in Ave Maria very long but, in true McQuade fashion, they have already become active members of the community and in Immokalee as well. Mr. McQuade is the small group coordinator for the Ave Maria Quasi Parish’s “That Man is You” ministry, Mrs. McQuade is on the welcoming committee for the parish, Hadyn and Eamon play violin at Mass, and Grace and Hope sing in the children’s choir. Additionally, the four teenage boys volunteered with their parents at the “Household of God” progr am this summer, and Keane bags groceries at Publix and has a knack for fixing broken cell phones. On the weekends, the younger McQuade children can be found splashing at the water park with their parents and the teenage boys love to play soccer and often play together. Eamon is a very talented soccer player. He joined the Immokalee Pit Cobras shortly after his family moved to Ave Maria. The team won the United States U-17 Youth Soccer regional tournament this summer, advancing them to play in the President’s National Cup tournament. “It was so exciting to watch the little town of Immokalee advance to nationals,” Mrs. McQuade said. The team’s coach, Manny Touron, is dedicated to helping the boys on his team advance, not only in their athletic abilities, but in all areas of their lives. He encourages them academically and promotes hard work and integrity. To him, it’s not just about soccer, it’s more about helping the youth be the best versions of themselves. That’s a mission the McQuades can get behind. In fact, that is how they came to meet a young man called “Chino.” Chino plays on the team also. He is from Guatemala and does not speak English, so he was not allowed to enter the public high school system. When they heard about his struggles, they asked if he would like to be homeschooled. He said yes and has been joining the McQuade children daily in their lessons ever since. A friend of Chino’s has begun homeschooling with the family as well. The family is happy to give these boys the opportunity for a better life. The family’s new home in Maple Ridge Reserve is almost complete, so they will soon be moving yet again. Let’s hope this is the last move they’ll be making for a very long time. They are looking forward to feeling settled in their new home in this great community. Welcome to Ave Mar ia, McQuade family! 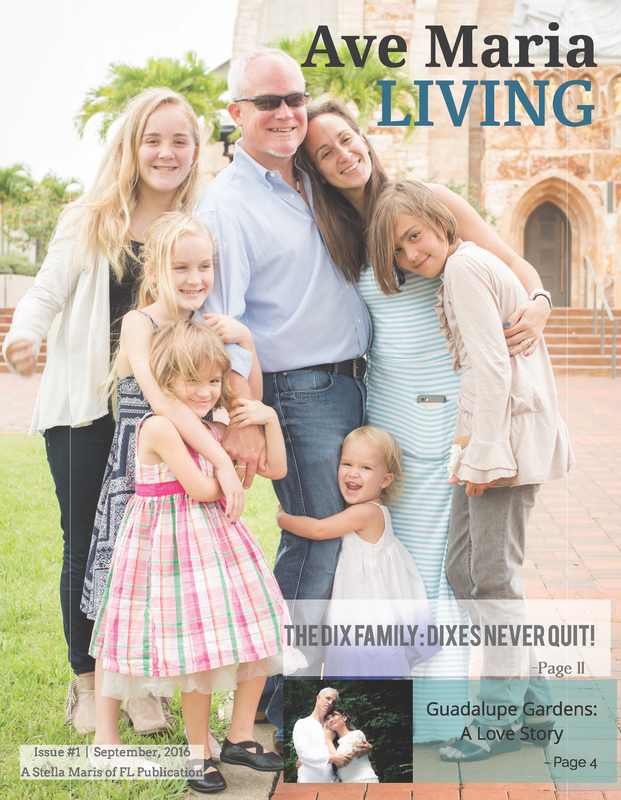 The Dix Family: Dixes Never Quit! Unique items with Ave Maria images & art on tshirts, mugs, jewelry, watches, accessories, home goods, & items for children & pets - & more. & variations of the same are all trade and service marks copyrighted, owned & used by this website & its owner Robb Klucik to market activities, events, news, institutions, businesses, & information related to Ave Maria, Florida & other Ave Maria projects to the world.